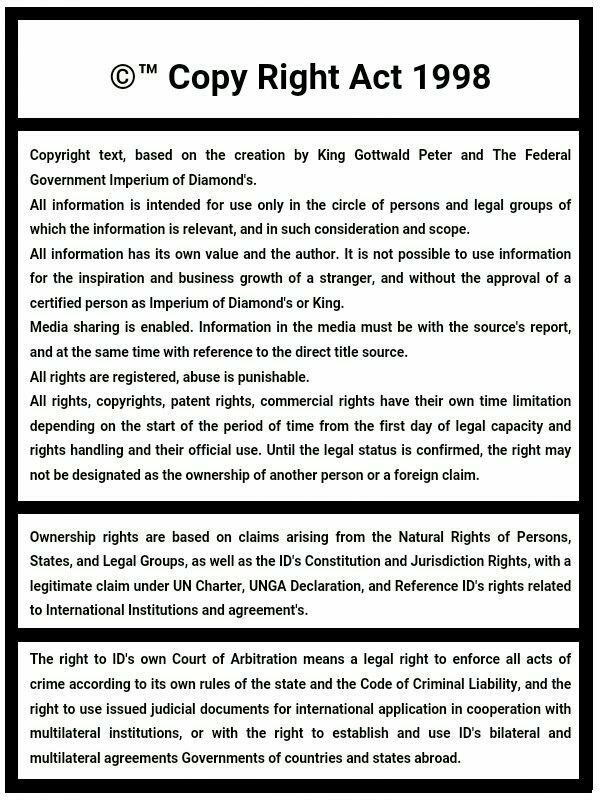 The constitution of the federal government Imperium of Diamond's has been known from the period in 1998 when there was a description of the constitution and the formation of intent for the establishment of government efforts to keep its own activity in accordance with international law and according to the system policy. Establishment constitution was subsequently blocked by means of hypnosis, tyranny, robbing the human rights of others and other illegal acts by the government of the Czech Republic. The basic description of the constitution in 1999 was based on the statements of the king, royal Mother, the Royal Family, Royal Council, Politicians, Army, departments of development and research, management civilization, foundation projects, media management, financial manipulation, schools, hospitals, format partial national democracy, citizens, other. The political system of natural character. The Royal Council was based, owing to the age of the King, and therefore the 1998 Royal Council addressed to the King of common Analysis of world politics, the system of international rules and regulations of other governments of countries in the world in terms of civil law, constitution and agreements, analysis of world political activities. Analysis of world civilizations and economic activity, the technological aspects of civilization and modernity. The Royal Council is established for the education of the King and expand its intelligence. The Royal Council is established to support the King in the interest of its plans for the development of civilization and modernization plan, expanding the economy and the government of the country, along with other responsibilities King of the country and the government. Imperium constitution and government of Diamond's is the first project based on the pursuit of legal unification of all governments in the world, the unification of all humanity and ensure the quality of life and the demands of nations. Government Imperium of Diamond's is therefore based on the form of the Federation under the Constitution of the word the meaning of values ​​League and system functions. Part of the description of the constitution because the format of federal activity in which every government in the federation acquires the right to maintain its own constitutional form of government and expand it to be able to synchronize with the federation. This means that the constitution of the federal government Imperium of Diamond is based on the format of cooperation between federal agencies in a common center of political movements in the form of government in the form of a multi government that is distributed to the government according to the constitution the King, and the other form of government according to the constitution of the federal government and in the scope of the sovereignty of their own territories and the Government of the central and federal government entity that is therefore automatically becomes a consistent format government central character due to a common central activity of the federation. In 2000 and 2003 originated a second proposal for the establishment of an international alliance for all the governments which have therefore set up a joint group and establish joint sovereignty in the territories universe on other planets around stars and in the interest of galaxies. The World Alliance of International Diamond. 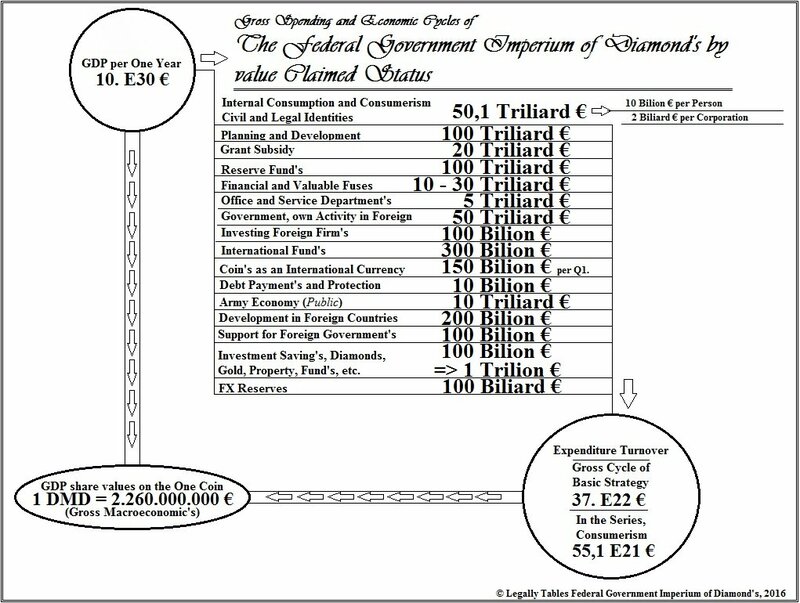 In 2013, it was written constitutional document of the Government Imperium of Diamond's a basic design of the International Alliance The World Diamond, in Vienna, Austria, at the same time again the second document government Imperium of Diamond's this year, in order to attempt to fix the first document, the document because it originated in Strasbourg, France, in the same year. The documents were written under the influence of illegal hypnosis on my person and therefore can not be considered the document as a 90% real. The documents are valuable only as further evidence of the efforts of government activity and expansion into a fully active subject. Draft constitution in France contained the Charter of Fundamental Rights and Freedoms, a document can be taken as valid and fully in accordance with approval from my person and without conflict. The document was designed according to the basic character of the Charter of Human Rights and Freedoms of the Czech Republic, I also created a dramatic extension of the rules in the interest of the necessity for security functions of the system, to ensure the safety of every person who will operate the enforcement of their rights and freedoms, at the same time so that every citizen could live free and full quality life intelligent man. The Charter can be regarded as a capable and sufficient responsibility to present values, the Government of The Imperium of Diamond's interest in the character of society. The Charter of Human Rights and Freedoms, according to my own designs better value than the International Charter for Human Rights of the UN. In 2013, in Portugal, in Lisbon was my attempt to create a constitutional document of the federal government The Imperium of Diamond's, according to the real principles of the first draft of 1998, and is now therefore in the interest of the dynamic sense of activity, the full capabilities of logistics, in the interests of efforts to the ability to fully extend the system constitution into a full deployment of the political activities of all interests which could be used. In the first phase, the natural formation activity arose only the first entries in the value of gross recording paper as a constituent of chapters which should be ultimately overwritten on paper or in digital format. Before you can run the assessment of the constitutional design documentation was stolen through criminal movement that was organized by the Government of the Portuguese Republic or the police. In 2014 originated a draft constitution for the political entity of the International Alliance of The World Diamond. The body and its constitution was made illegal under the influence of hypnosis. That is why the founding document in the interest of territorial values ​​of the European governments which, because of their political crime loses all claims to political legitimacy and political activity because through European crimes in accordance with international and European law from the European governments became global terrorism through entity that maintains criminal activity management territories, and therefore political, legal and according to the rules claimed regarded European territory as a land with the status of Terra nullius and to mine the just claims ratio European debt so the territory becomes legally claimed as my personal possession, so I'm getting person politically to show the highest character on the territory of the European governments are fully entitled owner and the rules of native politics, the nature of which is the basis of formation of any political rights world politics today, and again by the responsibility for such an act as a result of the only options for survival of European civilization and thus self-evident result in civil elections, just because of the situation with my need to obtain the claimed collaboration with other governments of countries around the world, therefore, was declared the constitution of the territory of the European countries, Terra nullius, because the government of The World Diamond all hodnotamy necessary for legal recognition as a government, however, interest policy The World Diamond as a federal entity under the constitution of the Federal Government The Imperium of Diamond's. At the same time, in order to value the real first value of the International Alliance The World Diamond in 2000 and 2003, the constitution has been damaged through the Portuguese minister of the country that through hypnosis caused my influence and forgotten claimed values ​​in the space of the universe and of civilizations, it is a denial of the value of the government and claimed estates worth planets, galaxies and stellar cities and civilizations of this type. The Government of the Portuguese Republic started handling my person and documents, and there was a creation of the first constitution of the body below the universal government, a government that never beat my plans and concerns for the creation or other activity, so the constitution of universal government false and without essence .. The constitution of the World Diamond through hypnotic coercion was based on values ​​as incomprehensible, without fully understandable format the provisions of the rules and their actual form or meaning, because it was once again the intention of the Portuguese Republic so that, in cooperation with other European governments that support terrorism. In 2014, it was written constitution of The Empire of Diamond's, the constitution of the name change through the hypnotic influence of my people, and hence the name of The Imperium of Diamond's to another format The Empire of Diamond which is known as the next evolutionary format of names Imperium, so the emergence of the fundamental character as a César. My real intention has always been to keep the name of the country and the government as the Imperium, and thus legalize politics as regime as office plans realistic policies and management civilization. The constitution of Empire Diamond was based on a statement of basic services and the political groups or parties of government, without naming other interests rules and the political system. The names of the departments as a basic summary of the constitutional scheme for government by themes for the period 2000 to 2010. The constitution was based on the territorial nature of European islands and other territories overseas territories that are left after the governments of the European countries followed the delimitation of territorial claims basic character. With the constitution of The Empire of Diamond's were listed other points of interest of the Government of The Imperium of Diamond's in the interest of millennial projects. In 2014, it was written a draft document for the establishment of the constitution which is based on a system of temporary government with the determination to take advantage of Western Sahara, in order to achieve the legal effect of all activities on the territory of Western Sahara and thus achieving steps that mean the establishment of an independent government that will be able to maintain legal rules in the process of national self-determination, without any possibility of danger from other people. Therefore, the constitution and my request for the entire world to support also the nations of Western Sahara. At the time when I will be able to free activity, then I will recognize Western Sahara's demands for independence from Morocco. In 2015 was in Spain, in Madrid created the original constitution of the political entity of the International Alliance of The World Diamond in full form rules, constitution and according to the actual interest, together with a list of territories Terra nullius European character as the property of the International Alliance of The World Diamond, and subsequently so again in relation Cosmic territories as a legally independent territories to the situation of territorial disputes between the European governments and the International Alliance of The World Federation of Diamond or Diamond's of Imperium. This means that the constitution is based on a system of territories in proportion civilizational stations, planetary civilization, Star City, the Galaxy Territories, systems Universal cities. Constitution won full and true character of policy co Alliance governments, the International Parliament and formats of cooperation between important stakeholders from around the world. The World Diamond constitution was written at the beginning of 2015. Work was interrupted for some time because of illegal repression. It was subsequently re-written constitution in mid-2015 and the date 06/09/2015 has been fully drawn into real form. The validity of the claim utilization constitution and international governments in the European format Terra nullius remains valid. Members of the International Alliance governments are therefore in case of indifference to the expansion of disputes and conflicts, fully entitled to use claim shared democracy for the possibility of rejection of European territories and therefore transfer back to full hands exercising the sovereignty of the Federal Government The Imperium of Diamond's, and that consequently in the interest of policy International Alliance will be used by eligible cosmic territories as described area as Stanic, planetary civilization, Star City, Galaxie, Universal City, more. If the alliance will be an extension of The World Diamond, that there is a political benefit, the rules of the constitution and it is entitled to establish the Alliance of debate in matters of development and expansion of logistics Constitution constitutional rules. So based system is back to the period of a first draft constitution International Alliance The World Diamond because it is based Alliance for International Cooperation. At the end of 2015 in Spain, in Madrid launched the effort to write-document constitution for the Federal Government The Imperium of Diamond's, and therefore in the interest of the actual names of the Constitution and the rule of Federation of The Imperium of Diamond's, also in the interest of pronunciation and nomination rules and their formats according to the actual values ​​of pronunciation habits in the political world. The Constitution is not under construction, Chapter I, constitution, at the same time Chapter II, federalization, while Chapter III, Territories and then will be listed documents in the interest of the other chapters that together create the original constitution of the Federal Government The Imperium of Diamond's why it will be again corrected this document The holdings, the document is therefore concluded subsequently becomes part of the constitution. 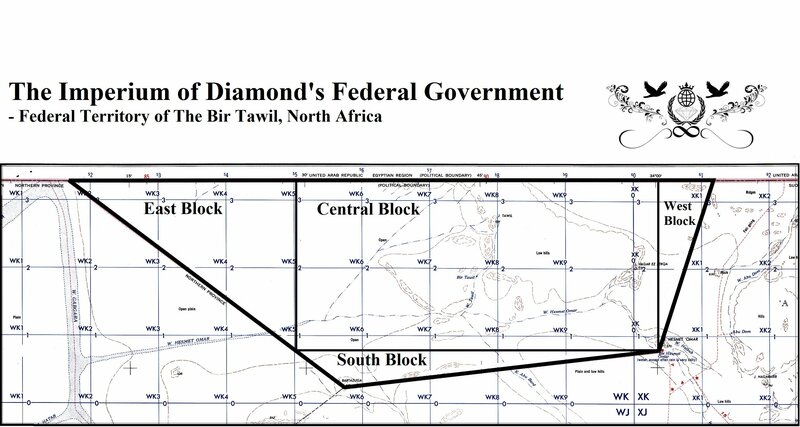 The constitution of the federal government Imperium of Diamond's in the interest of Chapters I, unable to reach the function of political accountability in relation to the duty of the necessary data constitution and look at international differences and values ​​of the constitution of foreign governments. 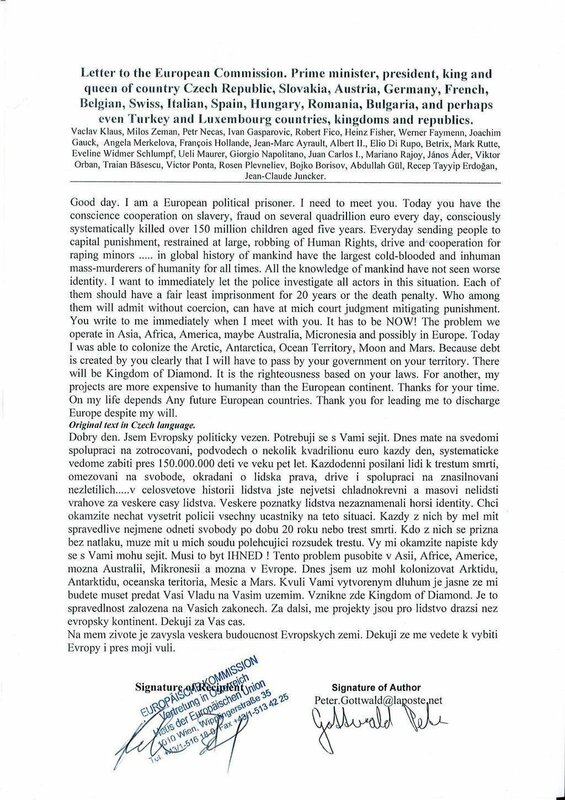 The document is only the first chapter which must be extended to other chapters and to ensure the full capabilities and functions of legal movement without causing unnecessary problems and inability to dorozumnění with, and thus the emergence of conflicts that can be completed full through the destruction of European territories and civilizations. Imperium constitution of the Federation of Diamond's is based and which basically means an expression of systems by policy form the first mentions and comments on the constitution and politics from 1999 until today. If expansion takes place Imperium The Federation of Diamond's, that there is a political benefit, the rules of the constitution and it is eligible for debate in the founding of the Federal Constitution matters of development and expansion of logistics constitutional rules. So based system is back to the period of a first draft constitution Imperium The Federation of Diamond's because the federal government is based on federal cooperation. Diamond Sutra, first known text written on paper, 800 year.